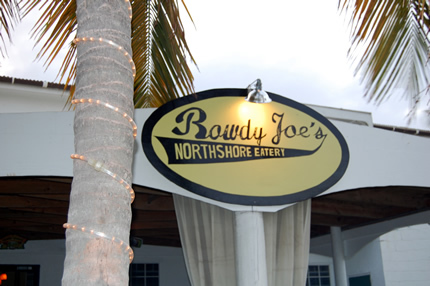 Rowdy Joe’s award-winning chef, Scott Bryan, cooks up “good mood food” using fresh local ingredients from St. Croix’s many farms and local fisherman. You can also enjoy an espresso, wireless Internet on the open air deck or come inside to watch your favorite sports with a local fruit margarita. Don’t leave without trying chef Scott’s homemade ice cream, like French vanilla praline or espresso white chocolate. Open for lunch and dinner, noon to midnight. Daily chalkboard menu, Rowdy Hour from 4:00 – 6:00 includes $1.00 off all drinks and complimentary bar snacks. Kitchen closes at 9:00 (dinner specials start at 6:00). Off-season starting June 1st, 2009 Rowdy Joe’s will be closed Tuesdays and Wednesdays and for the month of September.